Are you and your spouse speaking the same language? He sends you flowers when what you really want is time to talk. She gives you a hug when what you really need is a home-cooked meal. 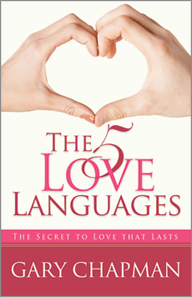 The problem isn't your love-it's your love language! What speaks volumes to you may be meaningless to your spouse. But here, at last, is the key to understanding each other's unique needs. Apply the right principles, learn the right language, and soon you'll know the profound satisfaction and joy of being able to express your love-and feeling truly loved in return.